A few small updates tonight. Both of the screenpacks were updated. Little changes are to be reported for the Samurai Shodown screenpack but the Vampire Savior one got new fonts for the fight screen thanks to The Dreamslayer and Cyanide, and a credits screen. Stages wise, information about the shadow were corrected in the Real Bout stages and two new stages from the same series were added. A bug with the Elephant Parade stage was corrected and music was added in the WakuWaku 7 stages. Finally, Tesse and Tsunade had their AI code updated for a better compatibility with characters using the same system. A couple of remaining bugs were also removed from Tsunade. Some parts of the code were updated and her ending was tuned a little bit as well. Tesse, the iron maid from the game WakuWaku 7 has been released. She has all her moves and only lacks her ending as well as more bug searching. Sparks and super finish backgrounds from the original game are also lacking but I'm not sure I'll add them. Make sure to get her along with her stages and enjoy playing with her ! I've just finished to update all my stages. Many of them were not converted taking into account the DosMugen limitations. As a consequence, shadows weren't appearing on these. The problem is fixed now. I've also ripped the music of nearly all of the stages and I've included them together. Since some stages use the same music, I decided to include the soundtrack only in one of them so as to save some space (I'm near my limit now). There are also six new stages, one half coming from Real Bout, and the other half coming from Waku Waku 7. The latter are Tesse's stages and I hope to be able to release a version of this character not to far from now. About these stages, they look better on WinMugen or LinMugen, since DosMugen doesn't handle very well the transparencies. I'm finally back on the Mugen business again. Within the next few weeks I'll upload a few updates of my previous complete works and make available a few WIPs. Let's hope that will push me into finishing them faster ^_^! I'll start this round of updates with Tsunade, the axe girl from Kabuki Klash. No big changes with her : I corrected a couple of issues, arranged a little bit the internal coding of a few specials and changed some commands to make them easier to use with a gamepad. I also added 6 new palettes, her game ending and a new portrait I took from the remix of Tengai Makyou Ziria. If you don't like it, the two previous ones are still available in the SFF file. 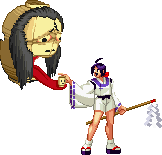 A new screenpack based on the game Samurai Shodown V Special is available in the Screenpacks section. There is a slight issue with the select screen music which doesn't loop perfectly, but it shouldn't be too troublesome. I've set up a temporary page with the Gals Fighters downloads. Since I haven't finished all the updates, I didn't put everything. At the moment, only half of the characters and a few stages are available. I'll complete it when more characters are updated. Edit : I made a couple of mistakes while uploading the Gals Fighters files, especially the screenpack. If you think something is missing or if you have many error messages, please download it again. Three new stages uploaded this evening. The first one is a false Samurai Shodown stage : actually, it is taken from Rera's introduction in Samurai Shodown V, that's why it hasn't the same dimensions as the other ones. 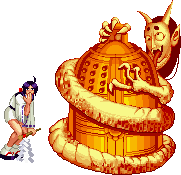 The second is Mai, Andy and Sokaku stage in Real Bout Fatal Fury Special. Quite a nice stage. I might do the 2 other versions. The last one is Mary and Yamazaki stage in Real Bout 2. Although I dont like the alternate version, I might do it as well to complete the set. For all these stages, I used Nebula to get additional material. That's why you might feel that the stage is unusually wide or high compared to other Real Bout Stages. Please also note that the last stage is not compatible with DosMugen. I finally moved the website. This change of host allowed me to install the Riot Of The Blood BBS. Now, if you want to leave a comment you cant use the Contact button to enter the BBS. I feel that this kind of BBS is much more adapted to personal small websites like this one than a traditional forum. However it seems that it's also a japanese speciality so if it hadn't been translated by Orochi Herman & Mattasaur, I would have never managed to install and configure it properly. So again, thanks a lot for letting me use it. As a side note, the picture at the entrance of the website is Alice Margatroid, a character from Shangai Alice's very popular Touhou series. This Alice was redrawn by Kmap for his own Touhou project I think. Since the webmaster likes his drawing style and since the name of this character fits with the name of the website, it was decided to use this picture. Feel free to spare some time from M.U.G.E.N. to discover the work of these people. In the end I couldn't resist to convert 6 new stages from SS5 and SS5 Special. The stages of these two games are so basic that they can be mugenized very quickly. They have hardly any animations, and when they have, most of the time the number of their frames is amazingly low. That shows how little resources were put into the creation of these stages. Most of them are nice though, otherwise I wouldn't have taken the time to convert them. I really like the european sailing ship stages ; they really make you feel the roll and the pitching of the boat. I guess I'm done now with the stages of these 2 games. There are still a few remaining ones but they are recycled stages from the previous chapters and they don't interest me much. Making a SS5 Special screenpack wouldn't be that bad now, but I guess that will wait until I'm done with my current characters. 1st October 2006 - Return to the M.U.G.E.N. world ! After something like 18 months I'm finally back to finish all the works that I left unattended. Well maybe not all of them, but at least I'm going to try to finish all those who were not too far from completion, namely Akari Ichijo from LB2, Mina Majikina from SS5 and Sayuri Kurata from EFZ. Those who were expecting to have new stuff right away will be disappointed since I don't have anything of that kind yet. I guess I'll upload some betas in the near future so that you guys see how far I've gone with my wips. So what am I offering today ? First of all, a brand new website entirely coded with the Notepad! Advantage of the Notepad : it helps keeping your coding clean (check the source of this page). Drawbacks : you don't see directly what you're doing and it usually takes more time to make a page. Well, since I'm not a designer, I don't really need something more complicated. After all, most of this website is based on my previous design. I just completed it and used the Gimp to create new logos. But then again, since I'm not that good at designing, this simple and clear one satisfies me well. Then you can download a new Rera. The second version of this character is finally 100% finished. I made some light corrections, and added a more classic gameplay to make her more appealing for those who cannot bear the Samurai Shodown buttons layout. I also corrected the intro of my Vampire Savior screenpack. The music didn't synchronize with the animation when using Winmugen. Not a big deal but I wanted this work to be completely clean. Finally, I created a Misc section where I put the musics I had ripped from Samurai Shodown IV quite a long time ago. If it became possible to play the music directly from the neogeo files or if an OST was released they might not be useful, but since I don't want to throw this work, here they are anyway.